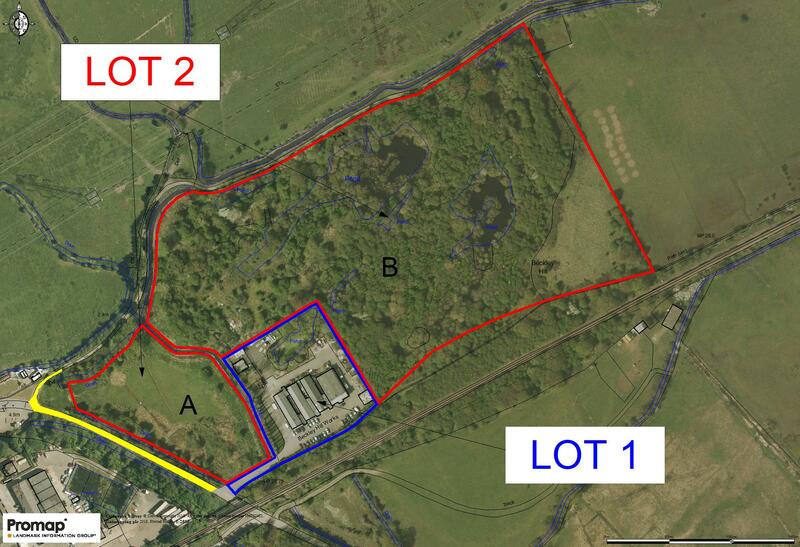 A compact commercial site comprising four let units and a let open storage yard with 18.3 acres of adjoining marsh land, woodland and fishing ponds. For sale as a Whole or in 2 Lots. LOT 1 - The Commercial Yard and Buildings include: A range of offices, workshops and general industrial units (B1/B2/B8) let on commercial leases (LTA 1954 Section 24-28 excluded) with a rental income of approx. £72,000 + VAT per annum. LOT 2 - The Land comprises: In all 18.3 acres comprising 2.6 acres of marsh land and 15.7 acres of unmanaged woodland and open scrubland, with a number of ponds. HISTORY: Beckley Hill Works has a long and interesting history, recorded in a Domesday Book synopsis as ‘Beckley Hill in industrial marshland’. In more recent times, the property was owned by Killick & Co and the land quarried for sand until the mid-1950s. From this date the property has been owned by relatives of the present freeholders. It was first purchased for general storage purposes in connection with the family’s engineering business and overtime the commercial yard has been constructed with the final building (unit 4) completing in 1979. From the mid-1980s to the present day the commercial site has been let through Higham Developments Limited, a management company established and owned by the freeholders. DIRECTIONS: The postcode of the property is ME3 7HX. From junction 2 of the M25 head coast bound on the A2 then leave at junction 1 of the A2/M2 onto the A289. Continue on the A289 then take the second exit, turning left onto the B2000. Continue on the B2000 for 0.5 mile then turn left on to the Lower Higham Road and continue for a further 1.5 miles until you reach a crossroads in the village of Lower Higham. Continue straight over onto Canal Road and after 1.0 mile the property will be on your right. SITUATION: The property is situated 2.2 miles to the north of Lower Higham village, on the edge of Shorne Marshes. It is 3.5 miles to the east of Gravesend and 4.0 miles north west of Rochester. Accessed directly from Canal Road, the property benefits from excellent transport links, it being within 2.5 miles of the A289 which connects with the A2 and then the M25 within 9.5 miles. Ebbsfleet International train station is within 5.5 miles offering direct services to London in less than 25 minutes and services to the Continent. The ports of Folkestone and Dover are also within approximately one hours drive. Beckley Hill Works consists of 5 units, an open storage yard and 15 shipping containers used for storage purposes, all on a site that extends to approximately 2.3 acres. Let to Deaves & Co Home Improvements , manufacturers of windows and doors. The tenant has occupied the property from the 1990s, agreeing a new lease in May 2015. The let area extends to approximately 3,220 sq ft and comprises office, male and female WC, workshop and store. Let to R&N Engineering, precision engineers. The tenant has occupied the property from the 1980s, agreeing a new lease in May 2015. The let area extends to approximately 5,115 sq ftand comprises office, male and female WC and workshop/factory. Let to Firco Ltd, interior refurbishment contractors. The tenant has occupied the property from 2011, agreeing a new lease in April 2016, prior to which it was occupied for manufacturing purposes. The let area extends to approximately 1330 sq ft and comprises office, male and female WC and workshop/store. Let to Crane & Plant Engineering, steel fabricators. The tenant has occupied the property for circa 15 years, agreeing a new lease in October 2017. The let area extends to approximately 4,280 sq ft and comprises office, male and female WC and workshop/factory. Presently Vacant and in need of refurbishment. Formerly occupied for office purposes and extends to 260 sq ft.
Let to R&T Scaffolding since circa 2010, agreeing a new lease in March 2018. The let area extends to approximately 7,500 sq ft and includes a gated compound with containers used for storage and office purposes. 15 former shipping containers owned by Mastacab and let under licence for general storage purposes. The land extends in all to some 18.3 acres comprising 2.6 acres of pasture/marsh land and an unmanaged area of scrub and woodland that extends to 15.7 acres, which includes approximately 1.0 acres of ponds. The land to the north and east of the commercial yard, marked B on the site plan, was formerly quarried for sand and ballast. The exposed pits were then used for landfill purposes. A copy of the Environmental Report for the land is available from the Agent on request. The land includes a number of ponds, previously let to a fishing club and a number of the fish swims remain in place but are in need of repair. The land to the west of the commercial yard, marked A on the site plan, has historically been used for seasonal grazing but has more recently been left fallow. Japanese Knotweed has been identified on this land, for which an eradication programme is in place. The property benefits from a right of way over Canal Road. Electricity- the incoming supply to the site is a 400v 3 phase TN System. Water - the water is supplied from an onsite private borehole. Drainage - the foul drainage is dealt with by way of two on site sewerage treatment plants. The property is located in flood zone 3 but benefits from flood defences. A copy of the Groundsure’s Environmental Report is available in an electronic format on request fromt the Agent. There is no relevant recent planning history for the site. The present uses at the site have been in operation for in excess of ten years but for the open storage yard that first operated from the site in 2010. The property will be sold on a Private Treaty basis as a whole of in two separate Lots. Beckley Hill Works is registered under HM Land Registry Title No TT50654 and is sold subject to the commercial leases and container licences currently in place. The purchase price is not subject to the addition of VAT.